Combines substances recognised for curbing telomere shortening. Used for extending life expectancy. Based on the latest advances in anti-ageing medicine, the nutritional supplement Telomeres Maintenance Formula has been developed to protect telomeres and fight the effects of ageing. Located at the tips of chromosomes, telomeres protect our DNA, but as we age, they become shorter, exposing our bodies to numerous health problems. Several studies have shown that telomere shortening is associated with cellular ageing, the development of certain age-related diseases and a decrease in life expectancy. reactivation of telomerase via the activity of certain bioactive compounds. an extract of green tea which contains antioxidant polyphenols such as epigallocatechin gallate (EGCG). In addition to protecting telomeres, the anti-ageing formulation Telomeres Maintenance Formula reactivates telomerase. Considered the ‘immortality enzyme’, telomerase counteracts telomere shortening. This enzyme, the discovery of which was rewarded with a Nobel Prize in 2009, halts the cellular ageing process by repairing telomeres and ensuring their growth. Given its key role in longevity, this enzymatic activity needs to be maintained throughout life. In this context, molecules have been identified that modulate telomerase activity, such as D-gamma-tocotrienol, a specific form of vitamin E found mainly in the fruit of the palm tree. Certain compounds in purslane also seem able to increase telomerase activity, hence the addition of a purslane extract and patented palm fruit extract (Tocomax®) to the formulation of Telomeres Maintenance Formula. 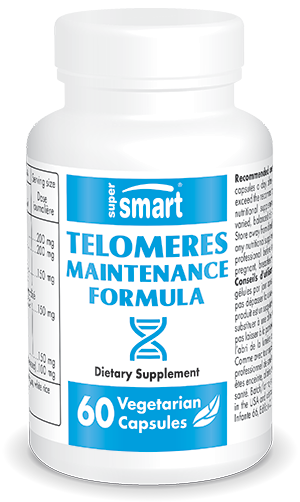 Combining the benefits of these various anti-ageing compounds, Telomeres Maintenance Formula offers a complete solution to telomere shortening. It is delivered in capsule form, with a suggested dose of two capsules a day to be taken after food, though this dose can be adapted in line with your therapist’s advice. To boost the formulation’s effect, it can be combined with other anti-ageing supplements such as Astragaloside IV, CycloAstragenol Maximum Strength, Resveratrol and Longevity Nutrients.